Brooklynn Stanley, a junior at Washington High School, is a competitor at the Celebration of Music competition. 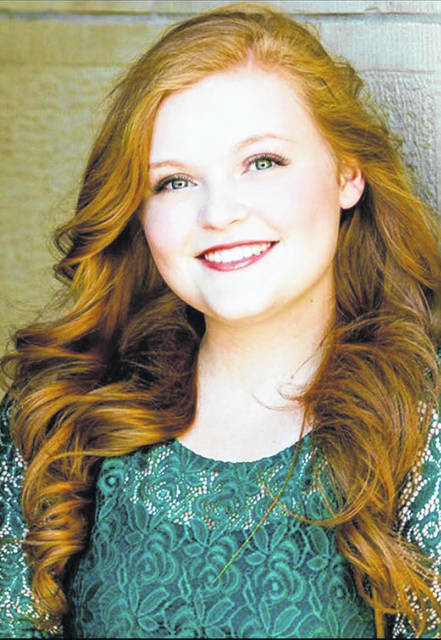 Washington High School (WHS) junior Brooklynn Stanley has been accepted into a talent competition hosted by “Celebration of Music,” a talent search group that gives talented singers, musicians, bands and dancers who are between the ages of 4 and 25 an opportunity to share that talent. Contestants send in audition tapes and are selected to advance in a competition. The People’s Choice Award is decided by votes. Those in the contest have profiles on the Celebration of Music website. One vote per email is allowed. Voting will also take place at the concert in Columbus. When someone votes in-person at the concert, one vote counts as 10. The winners will be announced during the concert and those winners will then sing live. Brooklynn explained that all the contestants must be ready to sing as they won’t know who actually won until the concert. The winners will also receive a trip to Los Angeles for another performance. Brooklynn is the daughter of Matt Stanley, the WHS band director, and Holly Stanley, a music educator of 23 years. Brooklynn’s brother, Carter Stanley, graduated from WHS in 2018 and is currently attending and marching at Ohio University. Brooklynn grew up in Washington Court House. As a current WHS student, she is actively involved in both band and choir, Rhythm and Blue Dance Team and student government. Brooklynn’s ultimate goal for the future is to go to New York to pursue her passion for performing. She wants to “become a Broadway star.” After high school, she does plan to go to college although she hasn’t decided which college to attend yet. To vote for Brooklynn, go to https://celebrationofmusic.com/brooklynn-stanley?fbclid=IwAR2wQvfdoOQUIjKxziENV-vKoF4Dal_j9E_7kGx9ggPz0WSawHLpSZlRVzg or you can go to celebrationofmusic.com click on “contestants,” click the upcoming Columbus show and that will lead you to all the contestants being voted on. Brooklynn’s profile is among them. Those interested in attending the concert and voting for her there can also buy tickets through the Celebration of Music website. Reach Jennifer Woods at 740-313-0355 or on Twitter @kenanipel.